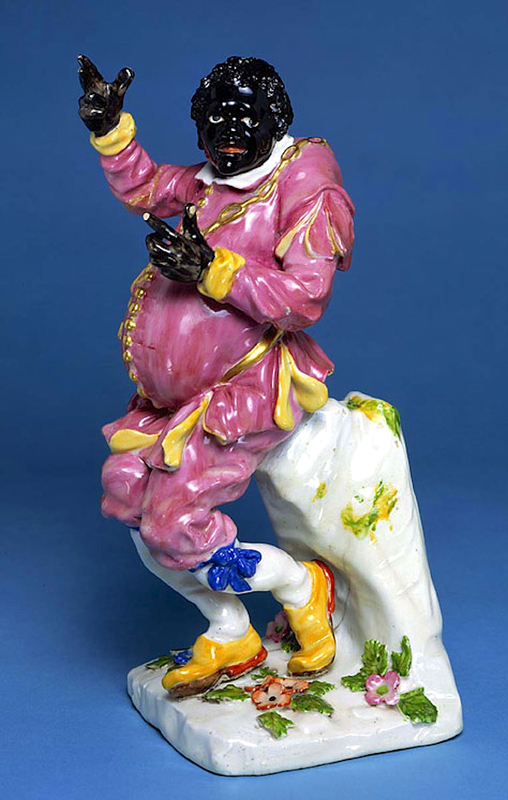 I’m definitely going to make this costume for a performance soon: a circa 1755 Chelsea porcelain figurine of the ancient Greek storyteller Aesop, of Fables fame. It’s in the Fitzwilliam Museum in Cambridge (Slightly Racist Ceramics Department). If Aesop was even real, the idea that he was black is a medieval misconception about his name somehow relating to “Aethiop” (i.e. Ethiopian), which it doesn’t. But whoever orginated this error can be forgiven slightly because it led to this gloriously innacurate, ahistorical and ridiculous image of a minstrel show Aesop transported two thousand years into the future, clothed in bright pink amateur dramatic Shakespearean garb, work boots and gold chains.